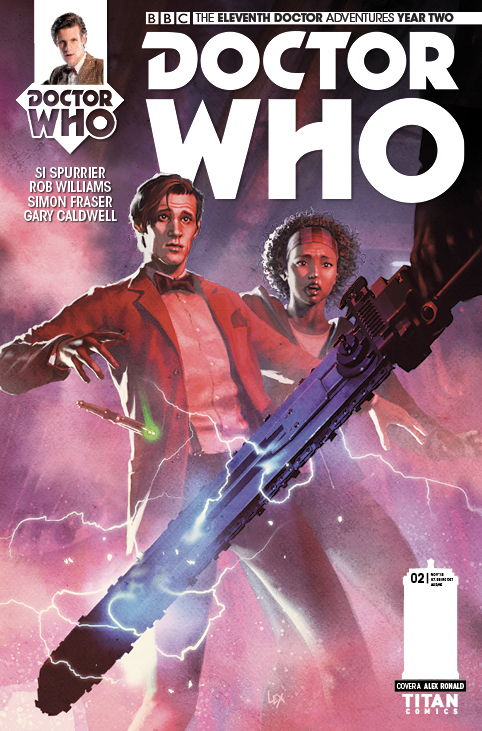 The second release from Titan Comics, second year run of the Eleventh Doctor places him right in at the deep end. 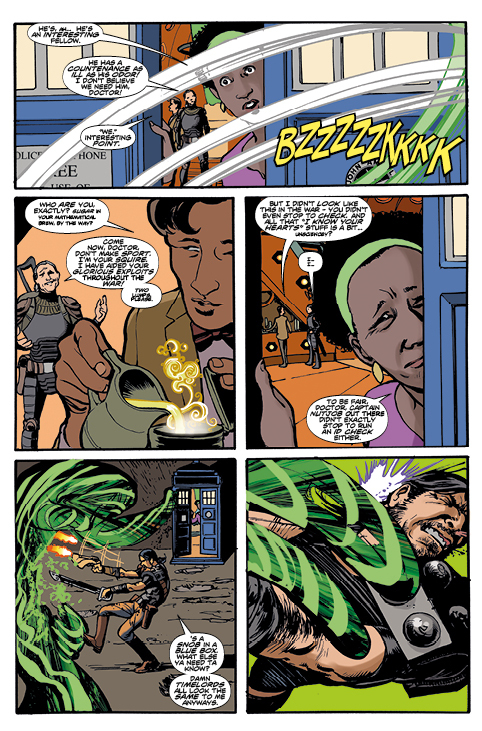 Previously, accompanied by (comic-companion only) library assistant Alice Obiefune, a small band of time war survivors, the Overcast lured the Time Lord into a timeless pocket dimension. They are under the impression that he is guilty of the ‘systematic annihilation of fifty generations of their people’. With the help of the Squire, an old woman in armour who once travelled with him, they escaped. Are you keeping up? This edition picks up from where that left off and doesn’t waste any time getting back into the action. 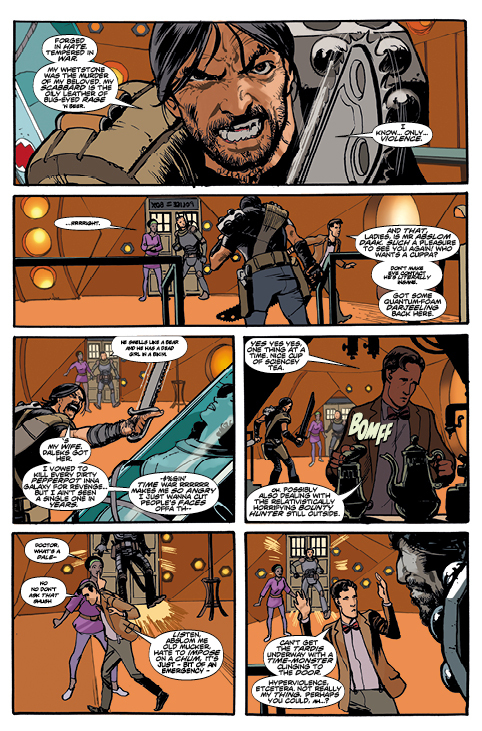 They have the urgent problem of uninvited guest bounty hunter Abslom Daak, to deal with. 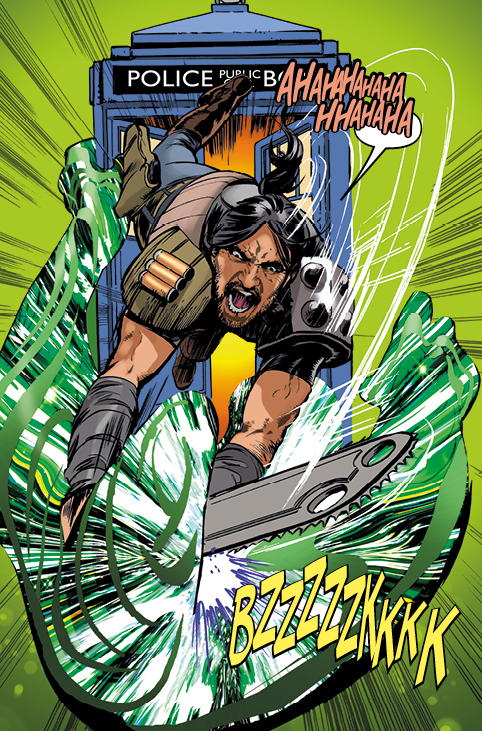 He’s seemingly not a nice piece of work, but is there more to the chainsaw wielding mercenary than meets the eye! The Tardis makes a pit stop, where they once again become stuck in a trap by the Cylors worshipping Overcast. The Doctor is paying the price for the actions taken by an incarnation that refused to even use that name (John Hurt’s War Doctor). Since he was introduced in ‘The Day of the Doctor’ it became clear that there was so much more that could be done with the character. Realistically there is little possibility of him returning to the series so it’s great that light is being shed through realises like this from Titians and Big Finish- (Only the Monstrous). It is such an interesting idea that the Doctor is picking up the slack for the things he did ‘without choice’, and one that I think has been very cleverly captured here. The only close comparison that could be made is when someone gets drunk and says and does things that they regret the next day. As with the style of modern ‘Who’, there is a great blend of action and humour here. You would expect nothing less from the Eleventh Doctor, who comes up with some cracking one-liners even when faced with immediate danger. ‘One thing at a time- a nice cup of sciency tea? !’ Artist Simon Fraser’s style of design is a little rough around the edges, mixing cartoons with more detailed close ups, but characters are certainly decipherable. On the whole, the second instalment will keep you as gripped as the first, mixing the action and humour of the Eleventh Doctor’s era perfectly with an extra sprinkling of references to the show’s past that will keep fans happy. At its climax, there are many problems still to solve and many questions still to be answered. New: Doctor Who magazine issue 521 out this Thursday!